Being healthy is not only about the physical well-being of a person but also the social and mental wellness. Most people are fully aware of and know that being physically ill like having malaria, typhoid, diabetes or hypertension is part of what could affect the human body and that it is normal to seek and receive medical treatment. But the majority of these people may not know or don’t believe that the same applies to mental illness. Having a psychiatric problem is a form of being ill, but this time it is the mind that has been affected and not the body. And it is equally normal to seek and receive treatment from medical doctors who are experts in that area: they are called psychiatrist. Physical sickness results when the body becomes overwhelmed by and can no longer withstand the environmental factors like disease-causing microorganisms and exposure to radiations that damage the genes, which it is regularly exposed to. For mental illness, the human mind is regularly exposed to factors known as psychological stressors like a job loss, death of a loved one, a relationship break-up, failure in an exam or a project. And the mind responds in the form of the person crying, feeling sad and depressed, being scared and anxious; this response can last for a few days after which the person returns to their normal mind. 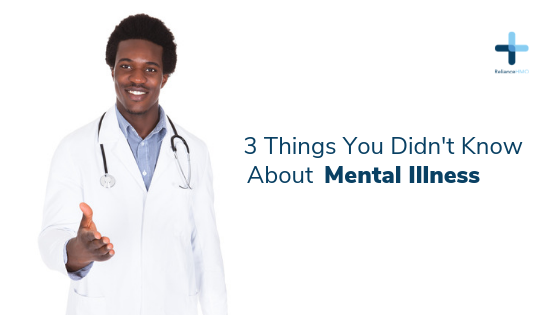 However, mental illness sets in when the mind becomes stressed out and does not return to this normal state. So the person involved remains depressed, sad or anxious for weeks and months and this causes harm to them in the form of affecting their relationship with other people, their family, and things they previously loved doing. In this case, the mind, just like the body, has become overwhelmed, can no longer withstand the psychological stressors and therefore needs treatment, showing of love and support by family, friends and the society. Like physical health conditions such as diabetes that can be genetically inherited, some types of mental illness have a genetic predisposition. This means that the likelihood of someone in a family with a history of mental illness having it later in life is higher than someone whose family has no history of it. The explanation is people have different mental stamina for withstanding psychological stressors, and those who, genetically, have a low threshold for withstanding stress may easily develop a mental illness unlike those with a very high threshold. For those with a family history of mental illness, it is important they regularly take time off to clear their mind of stress from work, family responsibilities, education and other project obligations. They can do this by going on vacation if they can afford it, regularly taking evening walks or jogging in quiet places; they may also need to have somebody that is trustworthy they can regularly discuss their life challenges with. And if they feel the stress is getting out of hand, they can visit any teaching hospital to seek mental health counseling from a clinical psychologist or a psychiatrist. There is so much stigma in the society towards the mentally ill: people use terms like they are mad or crazy in social settings to describe people with mental health challenges. This perception of mentally ill people is majorly due to a belief, which is entirely false, that they can transmit their madness to another person if anyone goes near them. But the truth is you cannot become infected with madness by someone with a mental illness. It is not an infectious disease like STDs or HIV/AIDS; it is a disease of the mind. People with mental illness are human beings like you and me. They have families, dreams, and ambitions, and they desire to be loved and supported. The successful treatment and recovery of a person with a mental illness partly depend on the love and support of the people in his or her environment. There is a great need to stop the stigma against the mentally ill.